All races start promptly at 5:30pm and are FREE to ALL. Arrive early to register/receive number plate. Registration table opens at 5pm. Only fat bikes with 3.8″ tires or wider will be allowed on course. Lights, helmets, and signed waivers required for every participant. Don’t have a bike? 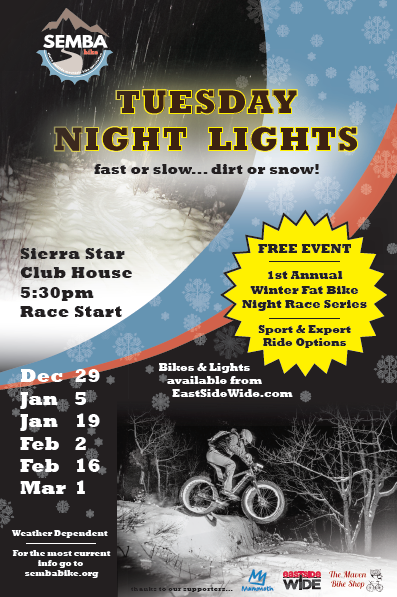 A limited number of fat bikes and lights are available for a discounted rate through Eastside Wide. Don’t be disappointed, book in advance. Ride as hard or soft as you like. No pressure. There will be always be two loop options (expert and sport). Dates and courses subject to change due to weather/snow conditions. This page is for general info and not updated throughout the season. For up to date course/race information, join our Google Email Group. Courses will feature human-packed and machine-groomed terrain, and vary from race to race. All routes will be marked with reflective tape on snow-filled cups (reduce, reuse, recycle). FUN is number one – and we’ll always strive to exploit the best terrain possible. SEMBA has an agreement with the private land owners to host these events. The trails are only open during SEMBA events, and not open to the general public. Stay on the groomed/packed trail. Please do not poach these trails on your own, or you might ruin our relationship and future opportunities for riding. IMPORTANT NOTE: These events take place on private property, which makes it the only legal opportunity to ride groomed trails in Mammoth. It is not currently legal for fat bikes to share any groomed trails on the Inyo National Forest. This includes ALL groomed snowmobile trails and nordic trails. SEMBA is working diligently with the USFS and the Town of Mammoth Lakes to change this. Until then, please support our efforts by riding responsibly and being an ambassador at every opportunity. Check out Fat Bike Mammoth for a list of legal winter fat biking opportunities in the area. THANK YOU to Mammoth Mountain Ski Area, Eastside Wide, The Maven Bike Shop and the SEMBA Snowshoe Pack N’ Ride Mafia for making this race series a reality! !